One family makes a daring decision, discovers the power of purpose, and encounters a God-sized passion for living. Something kept pulling at Jay and Beth Loecken, telling them there’s more to life than the pursuit of a large home, nice cars, and all the trinkets and trappings for a suburban family of six. They felt something stirring, a feeling that God had a different purpose for them, and they knew they had to do something—something big—to get started. 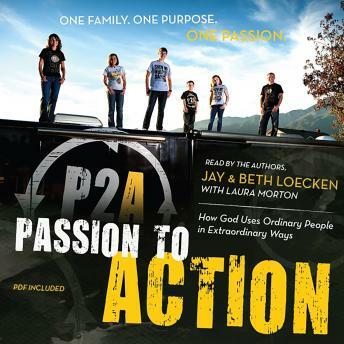 Passion to Action is one ordinary family’s tale of pursuing an extraordinary dream. It’s a story about asking big questions, seeking answers every day, and along the way discovering a big faith. What happens if you make a dramatic change? How does God sustain you in your new life? What will the people around you say? Find out for yourself what happens while listening to the journey of Jay and Beth Loecken. See just how far God takes them in their desire simply to serve - as a family - in soup kitchens, community projects, and churches across America. In this audio you’ll hear about Beth’s personal struggle with a troubling past, Jay’s battles with ambition, and the amazing solution they discover as they inspire others to take ten real steps to finding meaning and purpose. Through the story of the Loeckens, see how God leads us to places we’d never imagine, be inspired to better live from your life’s passion, and find the courage to turn it to action.